Today is the Mid-Autumn Festival also known as the Mooncake Festival. Held on every 15th day of the 8th month in the Chinese calendar. As the moon plays a significant part of this festival, people are celebrating it by eating mooncake. As a Chinese descendant, our family also celebrates this festival. Nothing fancy or big, just bought some mooncakes and share it among us. Today's bento was totally inspired by this festival. I used colorful egg sheets to make the decorations on the top of the rice. I made Chang Er and Hou Yi, two characters that are very popular in one of the Mid-Autumn Festival stories. I did not have much time to do a proper decoration on the face, so the characters became younger version of Chang Er and Hou Yi. Oh well ... you get the idea right? Inside the box : rice, stir fry Chinese cabbage with garlic, cherry tomatoes, and sauteed pork slices-pork ham-chili-spring onion. Wish you and your family a happy Mid-Autumn Festival! It's sweet & cute bento. Happy Mid-Autumn Fest! Enjoy eating mooncake too. @Bobo : Wish the same for you and your family! Thanks Bobo! Happy Mooncake Festival! The characters are adorable Lia! Now I want to go and look up their stories. Happy Mooncake festival! Now I know why chinatown here was so busy on Saturday! We couldn't get a table at our fave restaurant so we went to the one beside it. lol. 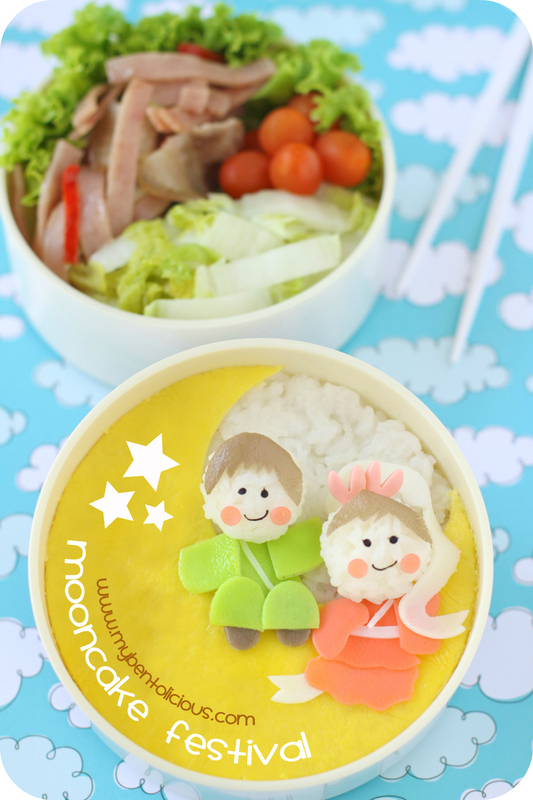 Love your graphics and esp, this super cute bento Lia! Oh my gosh, the characters with big moon, so awesome. A happy Mid-Autumn Festival to you and your family, Lia! As always, you do a stunning job with your bento creation! !